White Dog Blog: Hide Him Away? Here is my handsome, clever, fun-loving boy Vinny on our recent trip to Purina Farms. This picture was taken at their Visitor Center and he is smiling, which is his normal state of mind. You see, on this day, it was Saturday morning and the Visitor Center was full of children! In fact, we struggled at times to get a picture, as children were running up to him trying to pet him and say hello. Vinny loves children! They are just at his nose height and he thinks they smell divine! If you've followed this blog for very long, you know that I love to travel with and do all sorts of activities with my dogs. This blog just happens to focus on my dogs that are double merles and are therefore blind and/or deaf. But I do have other dogs too - dogs that can see and hear and aren't double merles. I enjoy doing things with them as well. I am a dog person through and through. My life does revolve around my dogs much of the time. And I love all my dogs - even the ones that can't see and hear. Living with them, those differences fade from the forefront. I don't focus on what they can't do. We spend our time figuring out how to do more and more together. You see, that is only their perception. I have my own perceptions of the situation, too. To me, my dog doesn't have any devastating disabilities. He is funny and smart and capable of doing anything - it just happens that he can't see or hear. He loves to play. He likes new adventures. He has a personality. I am not a rock star. I am just a person, just like these other people, who happens to see past the differences to see all those things that a blind and deaf dog has in common with me. And I have chosen to make him my friend. Some people say that me teaching Vinny to do fun things and earn dog sports titles is somehow encouraging people to want a blind/deaf dog just like him. They think that me enjoying my partnership with my dog is encouraging people to breed more dogs like him or to go out seeking a dog just like him. I guess they think I should hide him away somewhere where no one will see him - to keep him a secret that I'm ashamed of? Again, I don't do these things with my dog because he's blind and deaf. I do these things with my dog because he's my dog and we like doing things together! I like earning ribbons and titles with my dogs - all of them! I like traveling with my dog and watching him explore and learn about new things. I hate to think about what would have happened had I hidden away all of my differently-abled dogs! When I started this blog, there was hardly any useful information out there about working with blind and deaf dogs. So many were killed. So many people didn't think they were capable of learning anything at all - not even to be toilet trained! Without my brilliant dogs showing the world that they are feeling, thinking and learning dogs, there are many dogs that would not have been given the chance to find great homes. Today, there are many differently-abled dogs out there having great fun doing activities with their people! I love my dog just the way he is! But I would love him just as much if he had been born able to see and hear! It is not his fault that he was born this way. He wants to play and learn and explore. I want these things for him too. I don't want to hide him away. Yes, that means we do get a lot of attention. I use the attention we receive to help share with as many people as I can. I share about the consequences of breeding two merle patterned dogs together. I share about the realities of living with a blind and deaf dog - it's not all a piece of cake! There are challenges. There are rewards. I share with rescues and fosters and shelters how to teach these great dogs and find the best homes for them. I share to dispel myths. I share with fellow trainers so there will be more who can help clients with differently-abled dogs across the country and even around the world. I'm proud of my dogs. Please don't expect me to hide them away somewhere. How would you feel if someone expected you to hide your dog away somewhere? I know you're proud of your dog too. With anything that brings attention, there comes the risk that someone else wants to recreate it for themselves. If someone makes a movie about Dalmations and the dogs are so very cute, then so many people want a Dalmation whether it is the right breed for them or not. If someone makes the world agility team with a pyrenean shepherd and it's super fast, then many people want a pyrenean shepherd. If people see me working with a blind and deaf Collie, will people want to get themselves a blind and deaf Collie too? You get the idea. It's not the fact that my dog is blind and deaf that may make people want to imitate me. It's like this with anything - that is why we have fads. Someone thought something was cool and wanted it too. 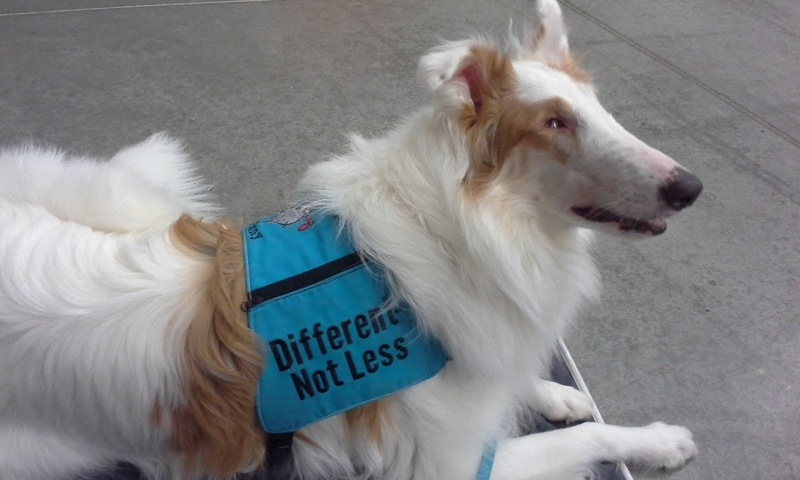 Education and advocating is the way to stop the double merle epidemic. Hiding them all away just won't work. I cannot stop the attention I receive from doing what I love with my dogs. My wish, though, is to teach compassion and responsible breeding. And to promote adoption of differently-abled dogs whenever it is the best match for that person. And always, I promote positive reinforcement training. This is the message I want people to get when they see me with my dogs. Don't create more of them - but for the ones that are already here, make their lives as full as possible! Well said! My dog is only deaf and I'm constantly surprised by how people think I've given up so much to have him. He's pretty much like my hearing dogs. We just communicate a bit differently. I would never hide him away! I love everything about this post. I was raised by a collie and a collie is my “go to” dog. When given the opportunity to adopt Candy from Tri-State Collie Rescue; I didn’t just jump at it but discussed it with my husband who would have to embrace everything that came with #1 - raising a puppy (which is a lot of extra effort #2 - raising a blind/deaf puppy. He got right on board. The really cool thing about these blind deaf dogs? Haha, they do not know they are blind and deaf; all they know is the joy of being very much alive. Candy is a very happy Collie and she keeps us laughing. So far when walking her around the neighborhood, our neighbors have been wowed by her beautiful white color and friendly Collie attitude. You do a wonderful job teaching compassion and responsible breeding. I always love seeing your photos on Facebook, too. I love Vinney's harness - different not less indeed! I can't imagine that seeing a double-merle dog and learning of the high probability of birth defects would encourage anyone to breed double merles... but it might help people think that they could adopt one. We celebrate the athletes in the Special Olympics, don't we? It doesn't make very many people either want to be disabled, or to want a disabled child. It does help them understand that disabilities do not prevent someone from having a full, active, satisfying life. A Birthday Full of Fun!